Alterations in gene splicing occur in human sporadic colorectal cancer (CRC) and may contribute to tumour progression. The K-ras proto-oncogene encodes two splice variants, K-ras 4A and 4B, and K-ras activating mutations which jointly affect both isoforms are prevalent in CRC. Past studies have established that splicing of both the K-ras oncogene and proto-oncogene is altered in CRC in favour of K-ras 4B. The present study addressed whether the K-Ras 4A proto-oncoprotein can suppress tumour development in the absence of its oncogenic allele, utilising the Apc Min/+ (Min) mouse that spontaneously develops intestinal tumours that do not harbour K-ras activating mutations, and the K-ras tmΔ4A/tmΔ4A mouse that can express the K-ras 4B splice variant only. By this means tumorigenesis in the small intestine was compared between Apc Min/+, K-ras +/+ and Apc Min/+, K-ras tmΔ4A/tmΔ4A mice that can, and cannot, express the K-ras 4A proto-oncoprotein respectively. The relative levels of expression of the K-ras splice variants in normal small intestine and small intestinal tumours were quantified by real-time RT-qPCR analysis. Inbred (C57BL/6) Apc Min/+, K-ras +/+ and Apc Min/+, K-ras tmΔ4A/tmΔ4A mice were generated and the genotypes confirmed by PCR analysis. 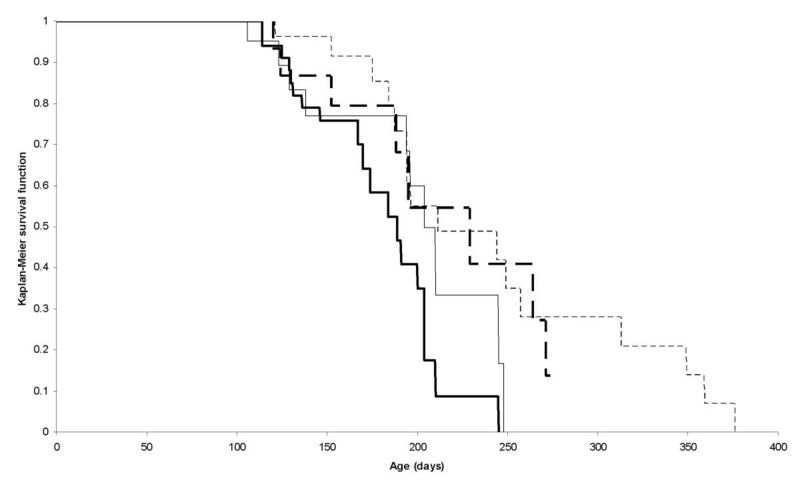 Survival of stocks was compared by the Mantel-Haenszel test, and tumour number and area compared by Student's t-test in outwardly healthy mice at approximately 106 and 152 days of age. DNA sequencing of codons 12, 13 and 61 was performed to confirm the intestinal tumours did not harbour a K-ras activating mutation. The K-ras 4A transcript accounted for about 50% of K-ras expressed in the small intestine of both wild-type and Min mice. Tumours in the small intestine of Min mice showed increased levels of K-ras 4B transcript expression, but no appreciable change in K-ras 4A transcript levels. No K-ras activating mutations were detected in 27 intestinal tumours derived from Min and compound mutant Min mice. K-Ras 4A deficiency did not affect mouse survival, or tumour number, size or histopathology. The K-Ras 4A proto-oncoprotein does not exhibit tumour suppressor activity in the small intestine, even though the K-ras 4A/4B ratio is reduced in adenomas lacking K-ras activating mutations. The development of sporadic colorectal cancer (CRC) involves genetic and epigenetic changes, including allelic losses in specific chromosomal arms, mutations of oncogenes, tumour suppressor genes and mismatch repair genes, micro-satellite instability, and methylation changes in gene promoters [reviewed ]. Additionally, CRC is frequently associated with altered splicing of tumour suppressor genes, and genes encoding enzymes, growth factors, cytoskeletal and cell adhesion proteins, hormone and growth factor receptors, and transcription factors [see [2–5]]. Importantly, since different splice variants of a given gene can have different or even antagonistic effects on diverse cellular functions, including apoptosis, proliferation, differentiation, angiogenesis and cell motility, a change in the splice variant ratio may actively contribute to tumour progression. Indeed, positive selection for splice variants that encode isoforms with a selective advantage in tumour progression is of potential diagnostic value and could provide therapeutic targets. Ras proteins are low molecular weight (~21 kD) GTPases which cycle between the GDP-bound (inactive) and the GTP-bound (active) state at the plasma membrane, and thereby regulate cell growth, apoptosis, motility and differentiation. K-ras activating point mutations occur in about 50% of human sporadic CRC cases and act by stabilising the active GTP-bound configuration, and so promote cellular transformation by constitutive activation of downstream effector pathways, including Raf kinases, phosphatidylinositol 3-kinases (PI3-K), and RalGDS family members [reviewed ]. K-ras activating mutations play a key role in tumour progression and metastasis in CRC by regulating angiogenesis and protease expression, and cell polarity, adhesion and motility [see [7–9]]. The K-ras gene encodes two splice variants, K-ras 4A and 4B, and activating mutations that usually arise at codons 12, 13 or 61, jointly affect both isoforms [reviewed ]. Importantly, since K-Ras oncoproteins differentially promote transformation, cell migration, and anchorage-independent growth, they most probably act in a cooperative manner to drive neoplastic progression . The ratio of the K-ras 4A/4B splice variants is reduced in human sporadic CRC in both primary adenocarcinomas and colon cancer cell lines that harbour K-ras activating mutations, including homozygous mutations [11, 12]. Since mutationally activated K-Ras 4B has an anti-apoptotic action [13, 14] and, unlike K-Ras 4A, can promote cell migration , and K-Ras 4B can drive expression of matrix metalloproteinase 2 (MMP-2) which specifically cleaves type IV collagen, and is involved in cell detachment and migration , the altered splicing of the K-ras oncogene in CRC in favour of K-ras 4B could contribute to neoplastic progression by enabling the survival of cells with DNA damage and facilitating tumour invasion and, ultimately, metastasis. Indeed, tumour growth and metastasis in human CRC is linked with increased expression of MMP-2 [see ]. However, the finding that the K-ras 4A/4B ratio is also reduced in CRC cell lines that lack K-ras activating mutations raises the possibility that a regulated switch in alternative splicing of the K-ras proto-oncogene may also have a causal role in tumour progression . The mechanism could involve increased expression of MMP-2 (see above), and/or reduced apoptosis given that the K-Ras 4A proto-oncoprotein exerts a pro-apoptotic action in mouse intestine following etoposide-induced DNA damage, and evidence that the K-Ras proto-oncoproteins have antagonistic effects on apoptosis in embryonic stem (ES) cells: Ras 4A promotes, whereas K-Ras 4B inhibits, apoptosis . Further, while K-Ras 4B, and probably K-Ras 4A, promote ES cell differentiation following withdrawal of leukaemia inhibitory factor  it is unlikely they do so with similar efficiency since the Raf/MAPK pathway regulates stem cell differentiation [reviewed ] and K-Ras 4A and 4B differ in their ability to activate Raf-1 . Therefore, in accordance with the 'stem cell model' for cancer formation we proposed that a change in the ratio of K-Ras proto-oncoproteins may further contribute to neoplastic progression by perturbing stem cell differentiation [see ]. Thus, altered splicing of the K-ras proto-oncogene could drive tumour progression in sporadic CRC by promoting MMP-2 expression, and inappropriate stem cell survival and self-renewal. To address the hypothesis that alteration in the ratio of the K-Ras proto-oncoproteins in favour of K-Ras 4B can affect tumour formation in the small intestine in the absence of K-ras activating mutations, K-ras tmΔ4A/tmΔ4A mice, which express the K-ras 4B splice variant only , were crossed with Apc Min/+ (Min) mice. The latter mice harbour a heterozygous germ-line nonsense mutation in the Apc (adenomatous polyposis coli) tumour suppressor gene, and are predisposed to developing multiple intestinal tumours initiated by loss of the wild-type Apc allele [reviewed ]. By this means tumorigenesis in the small intestine was compared between Apc Min/+, K-ras +/+ and Apc Min/+, K-ras tmΔ4A/tmΔ4A mice that can, and cannot, express K-ras 4A respectively. This approach was selected since K-ras tmΔ4A/tmΔ4A mice are healthy [16, 18], intestinal tumours in Min mice do not harbour K-ras activating mutations , and K-Ras 4A deficiency does not affect K-ras 4B expression in the small intestine  where, importantly, most (> 95%) intestinal tumours form in Min mice [reviewed ]. Thus, the effect of K-Ras 4A on tumorigenesis can be examined in the absence both of its oncogenic allele and of alteration in K-ras 4B expression as a consequence of K-Ras 4A deficiency. All animal work was carried out using procedures approved by the ethical panel of the University of Edinburgh and licensed by the Home Office (Project licence PPL60/3433). Inbred ApcMin/+ mice (C57BL/6) were obtained from The Jackson Laboratory (Bar Harbor, Maine, USA). The K-ras tmΔ4A/tmΔ4A mouse has been reported previously . Since penetrance of the Apc Min mutation is affected by genetic background, the K-ras tmΔ4A allele on a F1(129/Ola × C57BL/6) background was backcrossed for a further 8 generations on to the susceptible C57BL/6 inbred background. Resultant K-ras tmΔ4A/tmΔ4A mice were confirmed as congenic for the C57BL/6 Pla2g2a allele (Mom-1) by PCR as described previously . Inbred ApcMin/+, K-ras +/+ × Apc+/+, K-ras tmΔ4A/tmΔ4A crosses generated Apc Min/+, K-ras tmΔ4A/+ and Apc +/+, K-ras tmΔ4A/+ mice. Male Apc Min/+, K-ras tmΔ4A/+ mice were crossed with female Apc +/+, K-ras tmΔ4A/+ mice to generate informative Apc Min/+, K-ras +/+ and Apc Min/+, K-ras tmΔ4A/tmΔ4A offspring. Mice heterozygous for the Apc Min allele were identified by PCR as described previously that generates a wild-type (123 bp) and mutant Apc Min (144 bp) band . The K-ras genotype was determined using primers that amplify K-ras exon 4A, and primers that identify the mutant K-ras tmΔ4A allele by amplifying the neo cassette which replaces K-ras exon 4A, that generate 72 bp and 206 bp bands respectively . The genotyping of mice is summarised in Table 1. Survival curves for Apc Min/+, K-ras +/+ and Apc Min/+, K-ras tmΔ4A/tmΔ4A mice were compared using the Mantel-Haenszel test . Mice were culled immediately on showing signs of intestinal neoplasia, including anaemia, pale feet, hunching and/or swollen abdomen. A small number of mice (3 male and 4 female Apc Min/+, K-ras +/+ mice, and 4 male and 2 female Apc Min/+, K-ras tmΔ4A/tmΔ4A mice) with rectal prolapse, which were immediately culled, and also mice randomly withdrawn for tumour counts were treated as censored observations . Reclassification of mice with prolapse as uncensored observations did not affect any of the conclusions of the study. Mice were killed by CO2 asphyxiation and the small intestine removed, flushed with phosphate buffered saline, opened lengthwise, and mounted en face. Following fixation for 4 hours in methacarn (4 volumes methanol, 2 volumes chloroform and 1 volume glacial acetic acid) the number and area of all visible tumours was scored using a dissection microscope at 10× magnification. For examination of tumour pathology, "gut roll" preparations were made from mice with overt signs of neoplasia as described above, fixed in 10% buffered formalin, wax embedded, and stepped serial sections stained with haematoxylin and eosin. Mitotic and apoptotic counts were defined as the mean number of mitotic or apoptotic figures in a single high-power (× 400) microscope field within each of ten adenomas of the small intestine of comparable size and dysplasia in preparations from five or six individual mice (of both sexes combined) of each genotype, counting only intra-epithelial figures and avoiding debris in glandular lumina and any non-neoplastic epithelium on the adenoma surface. Tumour number, area, and mitotic and apoptotic counts were compared by Student's t-test. DNA was prepared from individual tumours dissected from the small intestine and screened for the presence of K-ras mutations at codons 12, 13 and 61 as described previously . Normal small intestinal tissue samples and tumours (at least 2 mm diameter, from mice with overt signs of neoplasia as described above, care being taken to avoid Peyer's patches) were dissected and frozen in "RNA later" buffer (Sigma) for subsequent RNA extraction. Total RNA (100 ng) was reverse transcribed in 25 μl volume using the iTaq SYBR Green RT-PCR kit (Bio-Rad) following the manufacturer's instructions. All real-time quantitative reverse transcription polymerase chain reactions (RT-qPCR) were amplified starting with denaturation at 95°C for 3 min, then 45 cycles of 95°C for 15 sec and 60°C for 1 min. The following exon-spanning primers were used: mouse β-actin upstream primer (5'-AAGCTGTGCTATGTTGCTCTAGACT-3'), and downstream primer (5'-CACTTCATGATGGAATTGAATGTAG-3'); mouse K-ras 4A upstream primer (5'-CCTGGTAGGGAATAAGTGTGATTTG-3'), and downstream primer (5'-GTACTGTCGGATCTCTCTCACCAAT-3'); mouse K-ras 4B upstream primer (5'-GAGTAAAGGACTCTGAAGATGTGCC-3') located in K-ras exon 3, and downstream primer (5'-CATCGTCAACACCCTGTCTTGTCTT-3') that spans the junction of K-ras exon 3 and 4B (specific for the mouse K-ras 4B transcript). The PCR product sizes derived from K-ras 4A, K-ras 4B and β-actin transcripts were 185 bp, 158 bp and 148 bp respectively. The specificities of the PCR reactions were confirmed by dissociation curve analysis and 2% agarose gel electrophoresis. All PCR products were analysed when in the exponential phase of PCR amplification. 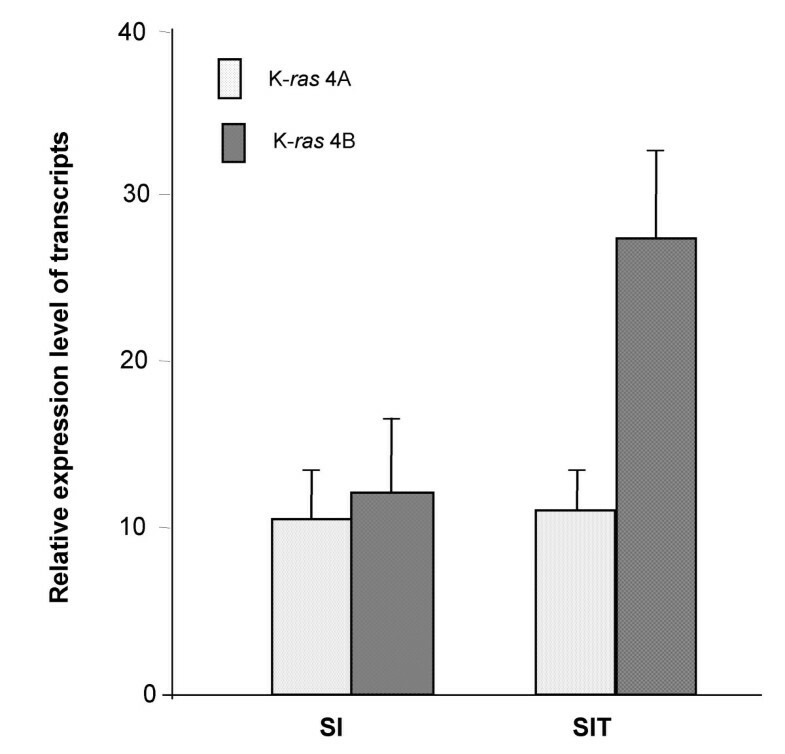 Quantification of the relative expression levels of K-ras 4A and K-ras 4B transcripts was performed using standard curves with normalization against those of β-actin transcripts from the same sample. The relative values were corrected for dilution factors and then corrected for the differences in size of 4A and 4B amplified products. Because the DNA binding affinities of the PCR primers and the sizes of the amplified products were closely similar for the K-ras 4A and K-ras 4B PCR reactions, and the standard curves also showed that the PCR efficiencies for the K-ras 4A and K-ras 4B PCR reactions were very similar at 74.8% and 76.1% respectively, the expression levels of these two different transcripts, K-ras 4A and K-ras 4B, can be compared relative to each other, setting the level of expression of K-ras 4A in wild-type C57BL/6 mouse lung as an arbitrary value of 1.0. Both K-ras splice variants are expressed in mouse small intestine [18, 24]. In the present study the relative levels of the K-ras 4A and 4B transcripts were quantified by real-time RT-qPCR analysis. Min mice were examined at 8 weeks-old before they showed any visible sign of intestinal tumorigenesis and, for control purposes, comparisons were made with age-matched wild-type mice. 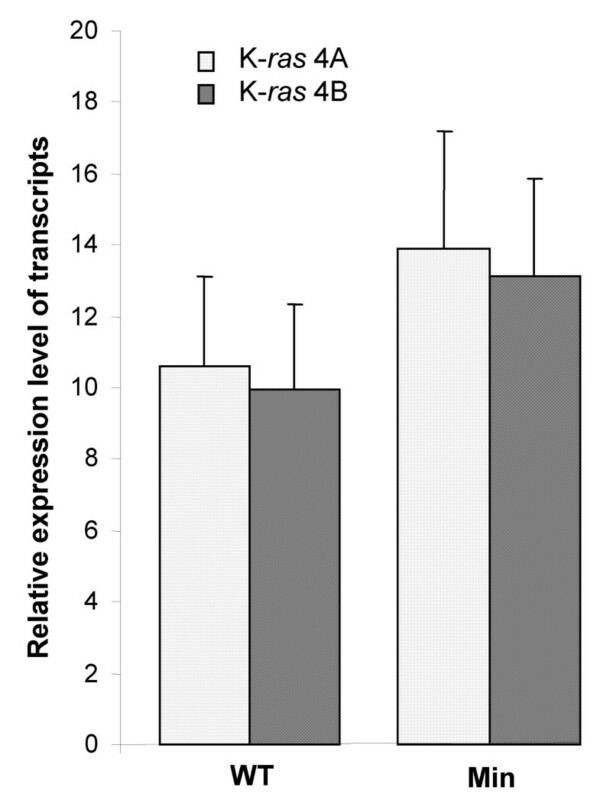 The K-ras 4A/4B transcript ratio did not differ significantly (P = 0.95) between wild-type (1.07 ± 0.09) and Min (1.07 ± 0.15) mice, and in both cases the K-ras 4A transcript accounted for about 50% of K-ras expressed in the small intestine (Figure 1). Real-time RT-qPCR analysis showing relative expression of the K- ras 4A and 4B transcripts (mean ± SD) in small intestine (duodenum) from 8 week-old, inbred (C57BL/6) wild-type (WT) and Apc Min/+ ( Min ) mice (6 male mice were analysed in each cohort). Light (stippled) bars, K-ras 4A; dark (hatched) bars, K-ras 4B. The reduced K-ras 4A/4B splice variant ratio in sporadic human CRC involves down-regulation of K-ras 4A expression . In Min mice (Figure 2), while there was no significant difference between K-ras 4A and 4B transcript levels in normal small intestine (P = 0.383), tumours of the small intestine showed significantly reduced levels of K-ras 4A relative to K-ras 4B transcripts (P = 0.0015). However, the reduced K-ras 4A/4B splice ratio was due to an increase in the level of K-ras 4B transcript expression, while the level of K-ras 4A transcripts was not appreciably altered. While this provides no support for the hypothesis that K-ras 4A plays a role in modulating intestinal tumorigenesis, it does not exclude this hypothesis, which is worthy of further examination given the high expression levels and established pro-apoptotic action of K-ras 4A in mouse intestine and the antagonistic effects of the 4A and 4B isoforms . Therefore, to determine if the K-Ras 4A proto-oncoprotein can modulate tumorigenesis in the small intestine comparisons were made between age-matched Apc Min/+, K-ras +/+ and Apc Min/+, K-ras tmΔ4A/tmΔ4A mice. Since gender may influence tumour development in the Min mouse [see ] males and females were considered separately. Mice were sampled randomly from the stock at 106 days when the stock was outwardly healthy, and at 152 days when 17% (19/112) of the stock had been either found dead or necessitated necropsy due to sickness [20% (12/59)Apc Min/+, K-ras +/+ and 13% (7/53) Apc Min/+, K-ras tmΔ4A/tmΔ4A]. Examination of the small intestine revealed a similar overall tumour number, and no difference in tumour size for both male and female mice at either time point (Table 2). Histological analysis of intestinal preparations from Apc Min/+, K-ras +/+ (n = 8) and Apc Min/+, K-ras tmΔ4A/tmΔ4A (n = 7) mice with overt signs of neoplasia revealed that all tumours from both genotypes were adenomas of similar, mild to moderate, dysplasia, with no evidence of invasive carcinoma in any of them. There was no statistically significant difference between the genotypes in mitotic counts (Apc Min/+, K-ras +/+: 25.3; Apc Min/+, K-ras tmΔ4A/tmΔ4A: 26.8; P = 0.468) or apoptotic counts (both genotypes: 2.1; P = 1.0) in the tumours. Consistent with the tumour data Apc Min/+, K-ras +/+ and Apc Min/+, K-ras tmΔ4A/tmΔ4A mice exhibited similar survival (Figure 3) for both males (χ2 1 = 1.91, P = 0.167) and females (χ2 1 = 0.44, P = 0.506). j vs. l P = 0.60; m vs. o P = 0.28; n vs. p P = 0.27 (Student's t-test in each case). Real-time RT-qPCR analysis showing relative expression of the K- ras 4A and 4B transcripts (mean ± SD of 6 samples in each case) in normal small intestine (SI) and tumours of the small intestine (SIT) of Apc Min/+ mice with overt signs of neoplasia. Light (stippled) bars, K-ras 4A; dark (hatched) bars, K-ras 4B. Survival curve showing Apc Min/+ , K- ras +/+ mice [ n = 20 males (heavy continuous line), n = 8 females (heavy broken line)] and Apc Min/+ , K- ras tmΔ4A/tmΔ4A mice [ n = 10 males (light continuous line), n = 16 females (light broken line)]. In each case n refers to the number of uncensored observations. Previous studies have established that intestinal tumours from Apc mutant mice, including adenocarcinomas, do not harbour K-ras activating mutations [20, 26, 27]. In confirmation, and to establish this applies in compound mutant Min mice, K-ras codons 12, 13 and 61 were sequenced in 27 small intestinal tumours, that included 8 tumours from Apc Min/+, K-ras +/+ mice, 15 tumours from Apc Min/+, K-ras tmΔ4A/+ mice, and 4 tumours from Apc Min/+, K-ras tmΔ4A/tmΔ4A mice. No tumours were found to harbour a K-ras activating mutation (data not shown). Because intestinal tumours develop spontaneously in Apc mutant mice they present a powerful model system to study factors that modulate intestinal tumour development, including genetic modifiers, which may be important in the design of potential therapeutic strategies [reviewed ]. To date, inactivating mutations in genes involved in arachidonic acid and sphingosine metabolism, DNA methylation, and genes encoding the matrix mellalloproteinase MMP-7, VEGF-A and matricellular proteins have been found to suppress intestinal tumorigenesis in Apc mutant mice. Conversely, inactivating mutations in genes related to genomic stability and DNA mismatch repair, and genes that regulate PI3-K/AKT signalling, and proliferation and differentiation in the crypt-villus axis, promote tumorigenesis [see [19, 25, 28–38]]. Because homozygosity for the K-ras null allele is embryonic lethal  nothing is known about the effect of inactivation of the K-ras proto-oncogene on intestinal homeostasis. The present study found the K-Ras 4A proto-oncoprotein, whose transcript accounts for some 50% of K-ras expressed in the small intestine, does not affect tumour development in the Min mouse intestine where tumours lack K-ras activating mutations. The result is perhaps unexpected given that the K-ras proto-oncogene can promote ES cell differentiation, exert a pro-apoptotic action in ES cells following DNA damage induced by etoposide or cisplatin [16, 40, 41] and, importantly, can suppress tumour development in the absence  as well as the presence  of its oncogenic allele. Moreover, the K-Ras 4A proto-oncoprotein exerts a pro-apoptotic action in both ES cells and mouse small intestine following etoposide-induced DNA damage . The failure of K-Ras 4A to affect tumorigenesis may reflect the fact that K-Ras 4A deficiency does not affect baseline levels of apoptosis in the crypt  and/or abolish completely the apoptotic response in the small intestine following DNA damage, but rather it is reduced and delayed, which implies activation of K-Ras 4A-independent apoptotic pathways. The complex relationship between apoptosis and cancer development is highlighted by recent evidence that the tumour suppressor activity of p53 in radiation-induced lymphoma is not dependent on its ability to promote apoptosis and so eliminate mutant cells . Therefore, the K-Ras 4A-mediated pro-apoptotic response in the small intestine following etoposide-induced DNA damage could be irrelevant for tumour formation and, indeed, it does not necessarily follow that K-Ras 4A has a pro-apoptotic action at physiological levels of DNA damage, or with other types of DNA damage. Thus, while the pattern of K-ras 4A expression is strongly conserved in human and mouse tissues [12, 18] its role in intestinal homeostasis remains unclear. However, given that K-Ras 4B can promote ES cell differentiation and suppress mammary carcinogenesis in the absence of its oncogenic allele [16, 44] it remains to be determined whether K-Ras 4B can suppress intestinal tumorigenesis. This would necessitate a comparison between Apc Min/+ mice that can, and cannot, express K-ras 4B. However, since K-ras is essential for mouse development  and K-ras 4B is the major splice variant and, unlike K-ras 4A, is expressed ubiquitously [12, 18], it is doubtful that K-Ras 4B-deficient mice would be viable, and therefore such a study would require conditional inactivation. In sporadic CRC the K-ras 4A/4B splice variant ratio is reduced in colon cancer cell lines, regardless of whether they harbour K-ras activating mutations [11, 12]. Since the K-ras 4A/4B ratio is reduced in primary CRC tumours  the altered ratio in cell lines, including those that lack K-ras activating mutations, is more likely to be symptomatic of the tumours from which they were derived rather than an in vitro artefact of the growth conditions. While altered splicing of the K-ras proto-oncogene in favour of K-ras 4B could, conceivably, modulate tumour progression, and possibly by effects on MMP-2 expression, apoptosis and/or differentiation (see Background), the present study found that alteration in the ratio of the K-Ras proto-oncoproteins in favour of K-Ras 4B (by targeted deletion of K-ras exon 4A) does not affect mouse survival or tumour number, size or histopathology (including mitotic and apoptotic counts). These observations are unlikely to reflect the fact that Min mice die before intestinal tumours can progress, since adenocarcinomas do develop in compound mutant Min mice [see [19, 29–31, 36]]. They could relate to the fact that the altered ratio in human CRC involves not only an decrease in K-ras 4A expression but also an increase in K-ras 4B expression : indeed, in Min mouse tumours, K-ras 4B expression is elevated while K-ras 4A expression is not appreciably altered. K-ras 4B expression was unaffected in the comparisons shown in Table 2 and Figure 3 because K-ras 4A deficiency does not affect K-ras 4B expression in the small intestine . Given that K-ras 4B, unlike K-ras 4A, can promote cell migration and MMP2 expression [10, 15], the possibility that increased expression of K-ras 4B, with or without reduced expression of K-ras 4A, is an essential component for tumour progression in cases that lack K-ras activating mutations remains to be addressed. Although the present study establishes that a reduction in the K-ras 4A/4B ratio does not affect Apc-driven intestinal tumorigenesis per se the finding that the ratio is reduced in Min adenomas that lack K-ras activating mutations raises the intriguing possibility that K-ras may have a more widespread role in tumorigenesis in addition to that in lung, colon and pancreatic cancers that normally harbour K-ras activating mutations [reviewed ]. Thus, given that K-ras 4A and 4B are co-expressed widely in mammalian tissues [12, 18] it remains to be determined whether their ratio is altered in other types of tumours that routinely lack K-ras activating mutations. Even though the K-Ras 4A proto-oncoprotein exerts a pro-apoptotic action in the small intestine following etoposide-induced DNA damage, it does not affect tumour development, albeit when expressed in the absence of its oncogenic allele. The study was supported by Cancer Research UK (CUK) Project grant C5/A4318 awarded to C.E.Patek, D.J.Harrison and M.L.Hooper. We are grateful to Alan Clarke for helpful discussion. CEP, study design, performed experimental studies, drafted the manuscript; MJA & FL, real-time RT-qPCR analysis, histopathology, edited the manuscript; LR, MW, PSD, RLB, NJL & RAR, mouse breeding, genotyping and tumour studies; OJS, contribution to study design, provision of cDNAs, edited the manuscript; MLH, statistical analysis, edited the manuscript. All authors read and approved the final manuscript.